21 Marlborough is located on the north side of Marlborough, between Arlington and Berkeley, with 19 Marlborough to the east and 23 Marlborough to the west. 21 Marlborough was built ca. 1866 for Charles William Freeland, for speculative sale, one of four contiguous houses (21-23-25-27 Marlborough). The four houses form two pairs of mirror opposite buildings (21-23 Marlborough and 25-27 Marlborough); each pair has a single entrance porch which creates a symmetrical entryway. Between July and October of 1985, Charles Freeland made a series of purchases from those who had bought land originally part of George Goss’s tract. He assembled a parcel with a frontage of 248 feet where 21-39 Marlborough would be built. He built the houses at 21-23-25-27 Marlborough for sale to others, and sold the land where 29-31-33-35 would be built. In the case of 37-39 Marlborough, he sold the land for 39 Marlborough, but retained the land for 37 Marlborough until after the house had been built. Click here for an index to the deeds for 21 Marlborough. On October 10, 1867, 21 Marlborough was purchased from Charles Freeland by Mary Ann (Binney) Hayward, the widow of Dr. George Hayward. Dr. Hayward was a surgeon and, in 1846, had been the first physician to use ether in a surgical operation. Prior to his death in 1863, they had lived at 16 Pemberton Square. 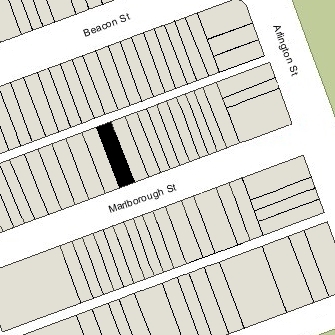 Mary Ann Hayward may have lived briefly at 21 Marlborough. In May of 1868 she purchased and subsequently moved to 159 Beacon. On May 14, 1868, 21 Marlborough was acquired from Mary Ann Hayward by Benjamin Robbins Curtis. He and his wife, Maria Malleville (Allen) Curtis, made it their Boston home. They previously had lived at 32 Hancock. They also maintained a home in Newport. Benjamin R. Curtis was an attorney in Boston. He served as a member of the US Supreme Court from 1851 to 1857, casting one of the two dissenting votes in the Dred Scott case. He resigned from the court soon thereafter and returned to practice in Boston. In 1871, he served as lead defense counsel in the impeachment proceedings against President Andrew Johnson. Benjamin and Maria Curtis continued to live at 21 Marlborough until his death in September of 1874. Maria Curtis moved soon thereafter and by the 1877-1878 winter season was living at 121 Marlborough. By 1876, 21 Marlborough was the home of C. H. Reeves. He continued to live there in 1877. On December 3, 1877, 21 Marlborough was acquired from the estate of Benjamin Curtis by wool merchant Lorenzo N. Kettle. He and his wife, Ernestine (May) Kettle made it their home. They previously had lived at 330 Walnut. 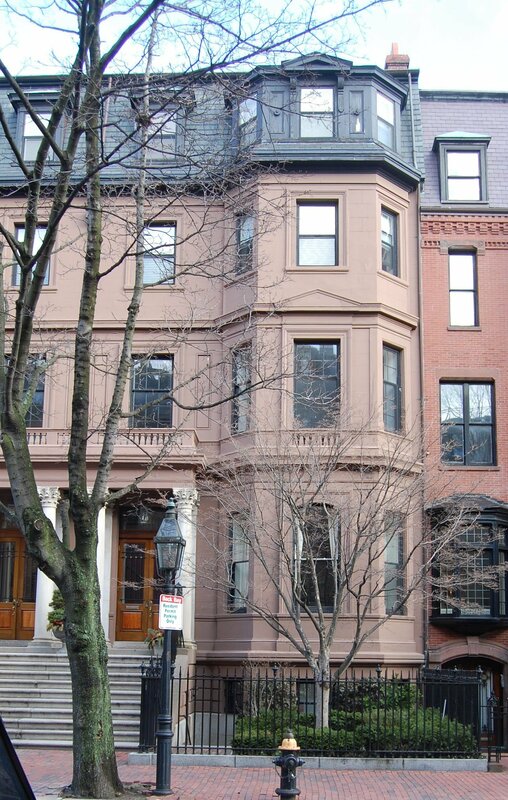 They continued to live at 21 Marlborough during the 1885-1886 winter season, but moved thereafter to The Kensington (northeast corner of Boylston and Exeter). On September 29, 1886, 21 Marlborough was purchased from Lorenzo Kettle by Miss Selma Wesselhoeft and her sister, Mrs. Minna (Wesselhoeft) Otto (called Mrs. Minna Wesselhoeft). Their mother, Ferdinanda Emilia (Hecker) Wesselhoeft, the widow of homeopathic physician Robert Wesselhoeft, lived with them. They previously had lived at 9 Newbury. Minna Wesselhoeft (Otto) was the widow of Moritz Otto, who was killed in October of 1861 at the Battle of Ball’s Bluff while serving in the US Army. Minna and Selma Wesselhoeft both were teachers and operated a private school in their home. Ferdinanda Wesselhoeft died in October of 1891. Minna and Selma Wesselhoeft continued to live at 21 Marlborough during the 1895-1896 winter season. In August of 1896, they traveled to Europe. By the 1896-1897 winter season, 21 Marlborough was the home of Mrs. Ann Bent (Ware) Winsor, the widow of Dr. Frederick Winsor, a physician. Their unmarried daughters, Mary Pickard Winsor and Elizabeth Ware Winsor, lived with her. Before her husband’s death in 1889, the Winsors had lived in Winchester and Ann Winsor had operated a private school. Mary P. Winsor had taught in her mother’s school and in 1886 she established Winsor School on Beacon Hill in Boston, which moved to the Fenway district in about 1907. Elizabeth Ware Winsor married in September of 1898 to Henry Greenleaf Pearson, a professor of English at MIT, and they moved to Weston. Ann Winsor and Mary P. Winsor continued to live at 21 Marlborough during the 1898-1899 winter season, but moved thereafter to Weston. Ann Winsor’s son, investment banker Robert Winsor, and his wife, Eleanor May (Magee) Winsor, also lived in Weston, where he was one of the major landowners. 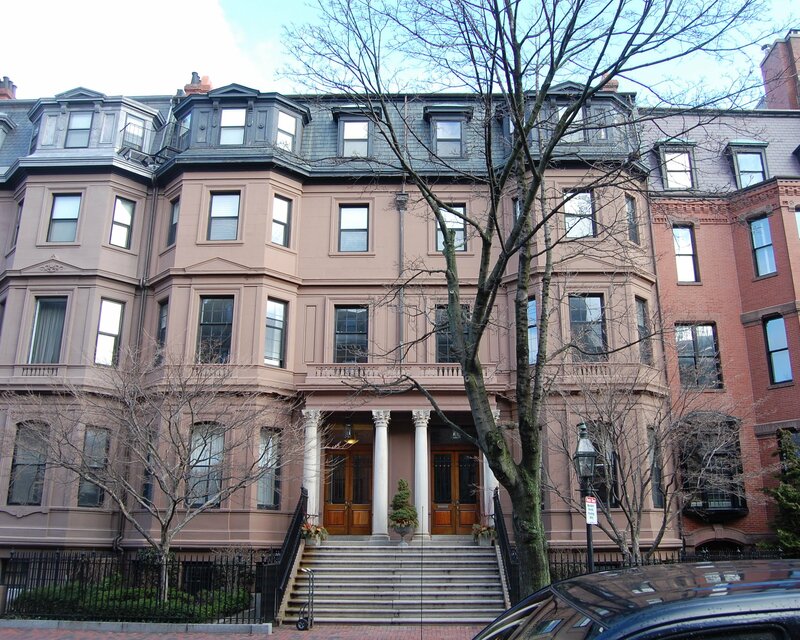 21 Marlborough was not listed in the 1900-1901 Blue Books. During the 1901-1902 winter season, 21 Marlborough was the home Fred Marshall Goss, a salesman, and his wife, Alma (Field) Goss. They had married in October of 1901, and 21 Marlborough probably was their first home together. They probably also operated it as a lodging house. On May 31, 1905, Eleanor Eleanor (Magee) Winsor, the wife of Robert Winsor, acquired 21 Marlborough from Minna and Selma Wesselhoeft. On the same day, she also acquired 23 Marlborough. From that time, the two houses remained under the same ownership. The Murrays continued to live at 21-23 Marlborough until his death in December of 1934. In May of 1989, Macmillan Inc. announced plans to sell Katharine Gibbs School. The School subsequently was purchased by Phillips Colleges. Probably in anticipation of (or as a part of) the sale, on June 29, 1989, the Katharine Gibbs Realty Trust transferred 21-23 Marlborough to Macmillan Inc. At the same time, it also transferred its ownership of several other properties, including 4-5 Arlington and 86 Beacon.